This is a one-on-two "glyph ball" of astrophotography images found in the Yahoo Flickr Creative Commons 100M Dataset. This visualization type maps a single variable onto two spatial axes, so that values for that variable correspond with closeness to a central point. 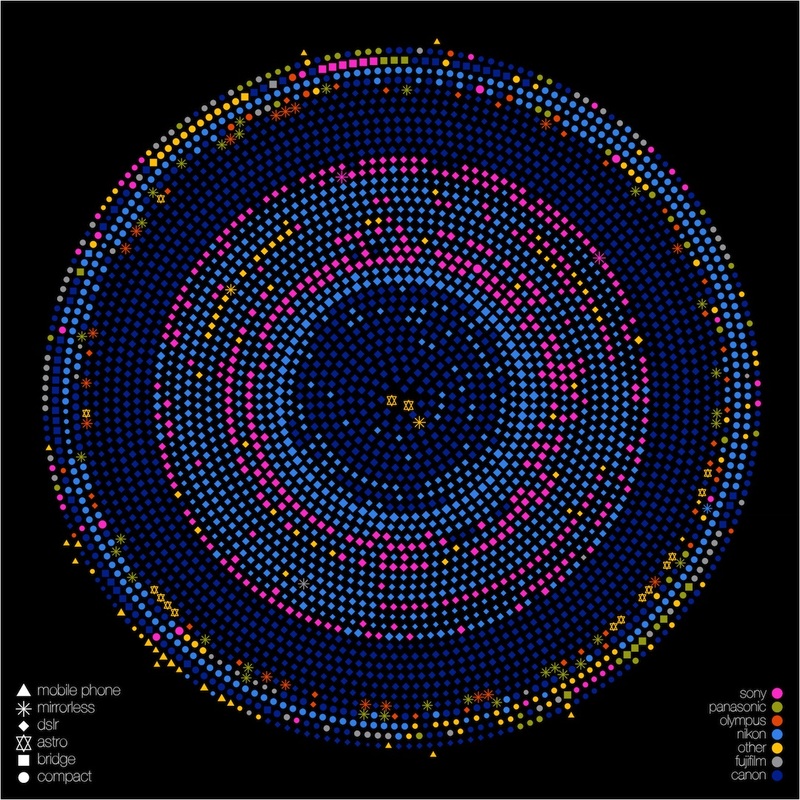 If the variable is ranked, this produces a tight circular cluster (and would be a sphere in a "one-on-three" visualization). Note that a ranked visualization is only informative if the plot elements have non-relational properties, as they do here, since the plot elements are glyphs. Here, the position of the glyph is mapped to sensor size, with the largest sensors in the middle and the smallest in the periphery. Color is mapped to camera maker and size to effective megapixels. The shape of the glyph indicates bodytype. We see that Nikon and Canon DSLRs predominate, with Canons forming a tight central ring, Nikon and Sony around it, and Canon again with a large band of smaller-sensor DSLRs. Beyond that, compact cameras of all kinds appear.